Due to the innovation that the world is currently experiencing, more and more gadgets are coming out on the market today. One of the most in demand is the fitness tracker, which can usually be worn while working out. Get to know more about it and the best fitness tracker to wear during your workout by reading the information below. The fitness tracker is becoming more and more popular because of the promise that it will help you keep out of your couch. This type of gadget can help you to get motivated to exercise more. In fact, according to fitness gurus, wearing a fitness tracker will keep you excited since you will get to track your progress. Now, if you are one of the many who is planning to get a fitness tracker, then knowing the factors to consider would be best. There are a lot of fitness trackers in the market, and it can be challenging to find the right one. Find out how to find the best fitness tracker that you can wear during your workout with the information provided below. Before purchasing your fitness tracker, it would be best to identify the activities that you are planning to do. For instance, if you need a tracker that will help record your steps every single day then choosing something that has that function would be best. You may also choose something that can contribute to tracking the calories that you are burning for each time that you will move. Of course, if you want both in one tracker, worry no more because there are also fitness trackers that can track everything that there is to track. The first thing that you need to do is to know the layout of the fitness tracker that you want. Some trackers can be clipped on your clothing, while there are some that can be worn around your wrist. There are also some that can act as a pendant and can be worn together with your necklace. Choose a design where you’re most comfortable to use. If you are planning to wear your fitness tracker all day, then choosing something that is water resistance would be best. Typically some of the water-resistant trackers can track your swimming activities, which is a plus if you are into swimming. Of course, you also need to check the price of the fitness tracker that you are planning to purchase. Typically these fitness trackers range from UD 50 to USD 300. If you want something that can track almost everything, then you should prepare to shell out a huge amount of money to get ahold of this tracker. But if you are okay with something that can track only the basic ones then it will probably range USD 50 to USD 150. Fitbit Flex 2 is perfect for newbies since this fitness tracker has automatic step tracking and as well as sleep tracking. It can also notify you through your smartphone about your progress. What’s right about this tracking device is that it can automatically detect your aerobic exercise, swimming, cycling, and more. For people who don’t know, it is always best to track them separately, for them to be able to provide an estimate that is accurate. Another good thing about Fitbit Flex 2 is that it will automatically vibrate and provide you with hourly reminders that you should better get moving. People love this tracker not only because it can track their every move, but it also has an attractive design. You can either wear this as a pendant or a bangle. Fitbit Charge 2 has a large sports screen, which will help track your sleep and your steps. It also can identify other kinds of exercises, including aerobic workouts, elliptical, treadmill, and as well as cycling. What’s good about this tracker is that it can also monitor your heart rate while you are resting and while you are doing your activities. Another good thing about Fitbit Charge 2 is that you can link it to your smartphone. You can receive text and call while you are working out using this tracker. In this way, even if you are working out, you will be able to see who is trying to call you or who sent you a message. The band that comes with this Fitbit device can be swapped into designs that are stylish. With stings, Steel HR is considered as one of the most attractive fitness trackers in the market today. It looks like an elegant yet simple analog watch, which features a small display. The display can help you check your heart rate and as well as notifications in your smartphone. What’s good about this tracker is that it has a sundial that is small, which will help you know if you are already meeting your goal day. Another good thing about With stings Steel HR is that it is waterproof. This just means that you can go for a swim wearing this tracker. If you are into style, then this tracking device is the one that you will need. Garmin Forerunner 235 is popular among triathletes and athletes since this device keeps on pushing them to go to the next level. This fitness tracker can monitor your heart rate, to ensure that the intensity of your workout will be recorded. To accurately track the distance, then the GPS feature of Garmin will surely help. What’s good about this tracker is that you will have the ability to control the music on your phone without having to pull out your phone. Notifications of text and calls will also be received in this device while you are working out. Another good thing about Garmin Forerunner 235 is that it is lightweight and thin, so you don’t have to worry about bringing this with you while you are working out. It certainly looks like a sporty watch that it is, but you may customize the looks and as well as the features of this fitness tracker. TomTom Spark 3 Cardio + Music is equipped with a GPS, which will provide you accurate information about the locations where you have run to. What’s good about this tracker is that the user can store music locally. All you have to do is to pair the device via Bluetooth to your headphones, which comes with TomTom Spark and you’re ready to go. Another good thing about this fitness tracker is that it can also serve as your guide whenever you are running into territories that you are not familiar with. The reason behind this is because the device will show you as to how you can go back to your starting point. Of course, just like any of the fitness trackers above, you can set TomTom Spark 3 Cardio + Music with your smartphone, for you to be able to get the notifications that you need while you are running. These are the top 4 fitness tracker devices that will provide you with the tracking information that you need. 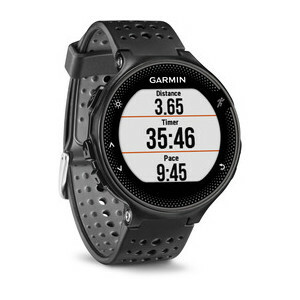 But among there 4, Garmin Forerunner 235 stood out because of its amazing features. It won’t only track your every move; it can also act as your heart rate monitor. It also has a GPS, so you no longer have to worry about anything, since everything that you need is already here. But watch out because this fitness tracker comes with a steep price of USD 329.99. Choose your fitness tracker wisely, for you to be able to start getting motivated to move and workout more. Forskolin Fit Pro Reviews – Used by Professionals? What is Basal Metabolic Rate (BMR)?